Every organisation definitely gets the intranet it deserves, but do you feel you have the intranet you deserve? It’s not all down to you of course; a great intranet needs decent sponsorship, budget, and an up-to-date strategy among a myriad of other things. Intranet managers are at the centre of a complex web, and need to have a clear vision of what the intranet must achieve and provide for the organisation and everyone within it. At this time of year, you might be planning a fresh start for your intranet, or at least a fresh approach to how you manage it and involve people in its improvement. We wish you the very best for the new year, and hope that you get the resources and attention you need to drive those intranet metrics upwards and provide business-critical services. Maybe you’re very much responsible for all the benefits that an intranet can bestow upon an engaged organisation, or maybe you’ve suffered the ignominy of being the techy pair of hands used to broadcast announcements – and nothing more. Take a look at Santa’s lists and see if you recognise his gifts. 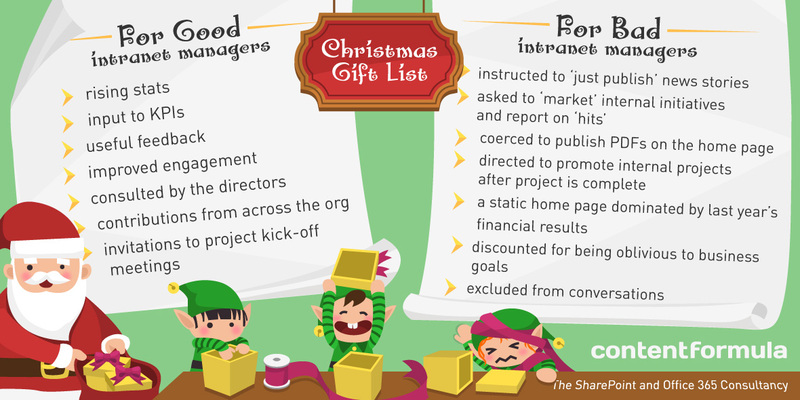 Whatever your professional ambitions, we hope Santa brings you exactly what you deserve, and that you can lead your intranet to even greater things in 2016.